Weighed myself first thing. Down 1lb. So 2lbs in 2 days. If I lost a pound every day for 2 weeks id be as happy as anything but as we will see further down, this is unlikely! 10.30am. First time I feel hungry today. Been to wholesaler to get flowers and bits I needed and drank water in the car but no hunger. Drank sunrise juice. I really like this one. 1pm Friend has been visiting since 11 and I’ve been too distracted to be hungry. 2pm – green juice. It’s no longer green after 3 days in the fridge and despite shaking it, remains an unattractive sludge colour. I manage half of it. 5.00pm feed kids. No.1 says “Mammy, where is your dinner” I said I already ate it, “no you didn’t he says” and comes back from the counter with 2 slices of thin base traditional sauce pepperoni Goodfellas Pizza, well I didn’t want to hurt his feelings…..
On day 4 (yesterday) I checked my weight and I was Still only 2lbs down. To be honest if I had stuck to it properly I might have lost more but I did my best for first attempt! Next time (next week) il be more prepared. Kids dinners will be done in advance and won’t be convenience food every other day and I’m going to have soup on standby for wobbly moments. I celebrated the end of the detox by having lasagne, chips, coleslaw followed by cake for lunch yesterday and suffered for hours after with cramps!! First things first. Weigh myself. At 7.30am. After the loo, with no clothes on. Down 1lb since yesterday. Excellent. Only a million left to go. Cycle to school with the kid. I feel so amazing and empowered by my 1lb loss that I even add an extra cycle on after the drop off. Feel amazing. Fabulous. 9.00am. Have sunrise orange/carrot juice. Continue to work away, facebook, twitter and website are very effective at distracting me from the hunger. I intend to have soup at lunch with friend and be super good and strong. Waitress: do you want bread with that? So I ate the BLT (but no crusts) and 5 of the kids fries and decide that’s the only meal I’l have today, I will remain strong and positive for the rest of the day. They forgot to give me my soup. I ask for it when I pay and take it in a carton. 3.30pm. Went to SW Class to distract myself. I hadn’t been in 2 weeks as was away last week with the husband. I was down 1lb. Hurrah! 5.30pm Cook dinner for the kids. Chicken curry and rice is requested. God this is torture. 6.00pm Feed the kids. Have my evening juice, the beetroot one, it’s ok if I have LOADS of ice in it. 8.00pm. Feel miserable, tired and cold. I have the soup I didn’t have at lunch and feel better. 10.00pm. In bed, wrecked, head hits pillow and out. I better be thinner tomorrow. 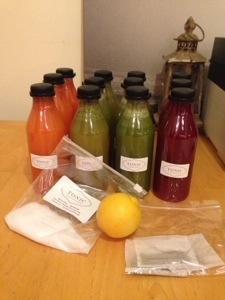 3 Day Juice Detox – the night before!! ….but he asked was that any different to usual???? I’m feeling afraid, but after Easter break and a trip away I’m determined! !